2- What′s so special about your tour and why should I book you? 3- Are your tours family friendly? Are children welcome? 4- Is there a minimum/max. age for your tours? 5- Are there any security issues? Is Munich and Bavaria safe? 6- Where can I find a Stabucks in Munich? 7- What are my payment options? 8- Do I need to provide a down payment? If yes, how? 9- Can I pay cash? 10- Can I pay you in U.S. Dollars? 11- When is the best time to visit Munich, Oktoberfest, Augsburg or Bavaria? 12- How many years have you been doing this? 13- Are tips included? Do I have to tip? 14- How big are your tour groups? 15- Do I need to pay for lunch/dinner for the guide? 16- When is Oktoberfest ? 17- Do you wear Lederhosen while your tour? Do you wear Lederhosen at home? 18- What′s your cancellation policy on tours? 19- Do you offer tours in other languages besides English & German? 20- Why is your website only in English? My nick name's Bodo, 36 years of age, original Bavarian breed and Mister Universe 2018. Well, all true except for the last part. But my wife says I'm very good looking. You can find out more in the "About me" section of my Munich Tour website. What′s so special about your tour and why should I book you? You won't have to share time with others except your family & friends in your group. I speak fluent English with no heavy accent, and will be able to comunicate with you, and you will understand my words and stories I tell you. BUT MOST IMPORTANT: I grew up and live here. I know the area and my history and will do my best to give you a great experience while you're in Bavaria. Are your tours family friendly? Are children welcome? YES! All my tours are family friendly and children are welcome. Is there a minimum/max. age for your tours? I keep my tours family friendly and all ages are welcome. You will however need to be at least 14 (ok, 16) to drink beer on the Oktoberfest, Beergarden or "Evening with Bavarians"-Tours. If you have children under this age, there is no problem if they acomodate you. They can visit all the venues. Are there any security issues? Is Munich and Bavaria safe? Yes. Germany in general has a very low crime rate. Gang violance is not known in Germany. Locals on the country side usually don't even lock their doors. However, just use common sense and caution while here, since there might be petty thefts out there. Where can I find a Stabucks in Munich? You can find a list of all Starbucks venues in Munich here. Beleive it or not, this one of my mosked asked questions. "In God we trust, all others pay cash." - You can pay cash on the day of the tour in Euro or US$. Do I need to provide a down payment? If yes, how? In some cases a down payment is needed to gurantee your tour for the requested time and date. You can do this over credit card with PayPal. If nothing else is mentioned, the tour price is payable in cash on the day of the tour. Yes! You can pay the outstanding balance on the day of your tour in cash. Can I pay you in U.S. Dollars? Yes! Besides the official currency of Germany (Euros), you can pay me in US$, too. If you choose this option while booking, I'll inform you of the outstanding balance in US$ the day before your tour (due to exchange rate fluctuations). Please note, that you'll receive change though in Euros. When is the best time to visit Munich, Oktoberfest, Augsburg or Bavaria? My favourite months are May & September for the weather, and December due to the Christmas season and all it's beautifull markets. But anytime of the year is nice to visit. We do have all seasons though, hot & humid summers, cold and snowy winters. If your from the east coast, you're usually used to it. Beleive it or not: The best time to visit Munich ist NOT during Oktoberfest. Everyone except the locals seem to be here and you'll pay a steep price for hotels and such. The only reason to come here during the middle of September to the beginning of October? Well, Oktoberfest. If this is the reason, then go for it. If you just want to visit Munich, do it before or after Oktoberfest. I've been doing tours for over 17 years now. Are tips included? Do I have to tip? Tips are not included and are entirely up to you. If you liked the tour, I'm always happy for some appreciation. Most of my tips are donated to local charities. I can do groups of any size, but almost all of my groups are private, the size depends on how many guests are in your group. Prices are qouted up to 5/6 guests (depending on the tour). Additonal fees may apply if your group has more then 5/6 guests (depending on the tour). Do I need to pay for lunch/dinner for the guide? It starts on 21st Semptember 2017 and ends on 6th October 2017. Please note, that the Oktoberfest Tour is only offered during this time. Do you wear Lederhosen while your tour? Do you wear Lederhosen at home? 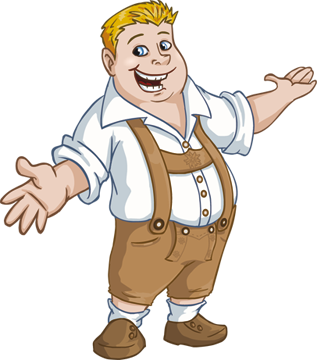 "Lederhosen" (translates to "leather pants") are the traditional dress for men in Bavaria. If you wish, I'll wear them during the tour and explain you all the little details only the locals know. But in daily life you will hardly find locals who wear them (except for special occaisions). So if you see people walking around, feel lucky to see them and take a picture. And yes, I do wear them at home, but not to bed. What′s your cancellation policy on tours? Less than 14 days in advance: No Refund, but you will however have the chance to reschedule the tour*. 24 hours or less in advance: No Refund, no rescheduling. *If you cancel less than 14 days with me, you may use your down payment towards another tour/same tour with me (if space available). Credits have to be used within 3 months of issue. Example: If your tour is on 20 July, you can cancel until 05 July and receive a refund. If you cancel on or after 06 July, no refund. Your issued credit is valid until 05 October of the same year. EXCEPTION: to the above: Any downpayent that is marked as non-refundable is non-refundable. Credits or rescheduling does not apply. In the unlikely event I need to cancel out of any reason (sickness, family emergency), you'll receive a full refund of down payment. In this case I am also not responsible for any charges that occur on your end (i.e. booking with an other company, change of your travel plans and associated rebooking fees etc.). Notice: Due to currency exchange rates and/or credit card fees, the refund amount can be different from the amount that you payed. We are not responsible for these (usually) minor differences. Do you offer tours in other languages besides English & German? YES! I also do Bavarian, Latin & Klingon. But I'll give Ewok a try if you want me to. If you're looking for a tour in Japanese, French, Russian, Dutch, Afrikaans, Arabic or any other language and would like me as a tour guide, I can provide a translator for the day (at your own expense). Why is your website only in English? 95% of tours I'm booked for are in English. I'll try other languages (see above), but I love talking English, so I specificaly made a site for my English speaking tourers.